Date Night does not get to Buckhead much. The traffic from our headquarters in Marietta just does not allow for us to venture into this part of the city. 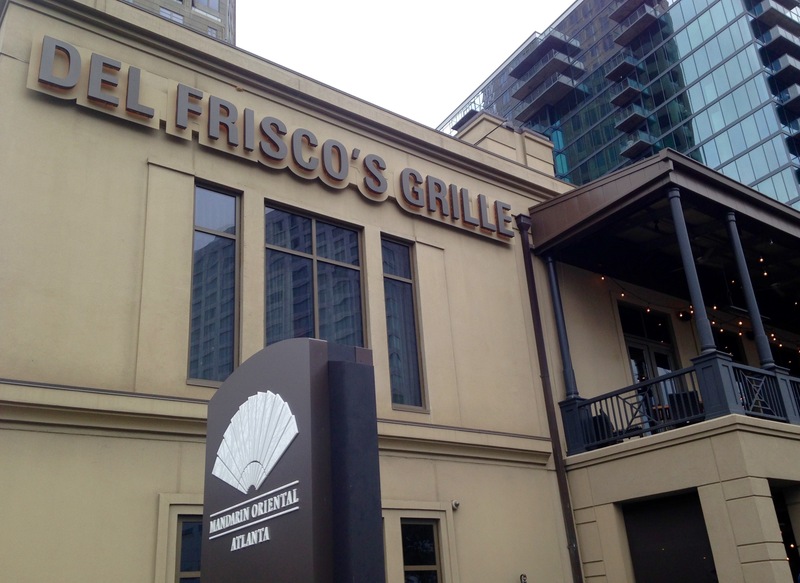 When the folks at Del Frisco’s Grille invited us to lunch to try out their “Grab A Pair” menu, it was a great opportunity to drive into Buckhead, especially earlier in the day when there is not as much traffic. 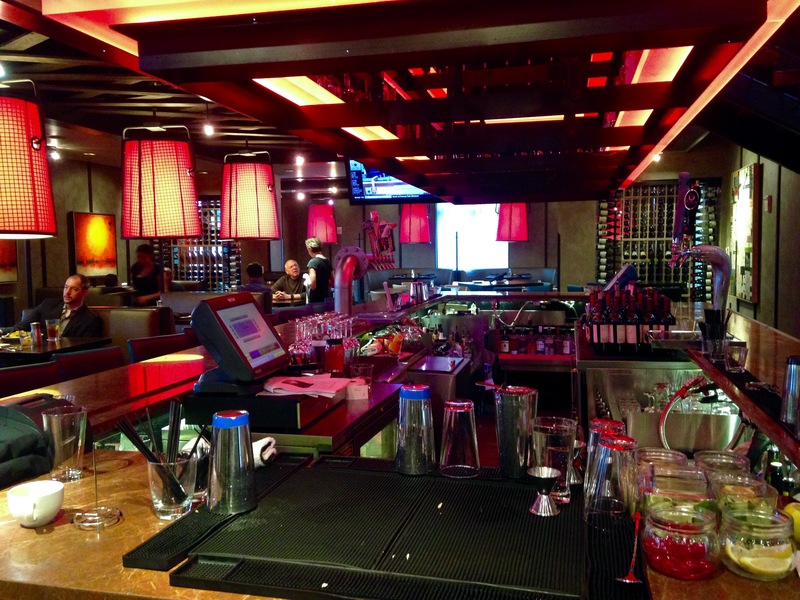 Del Frisco’s is a high-end chain with 21 locations throughout the country. The Atlanta version is located right in front of the Mandarin Oriental hotel on Peachtree. If you work in any of the umpteen office buildings in this area, you can walk to lunch. If you drive, be prepared to hand your car over to the valet. 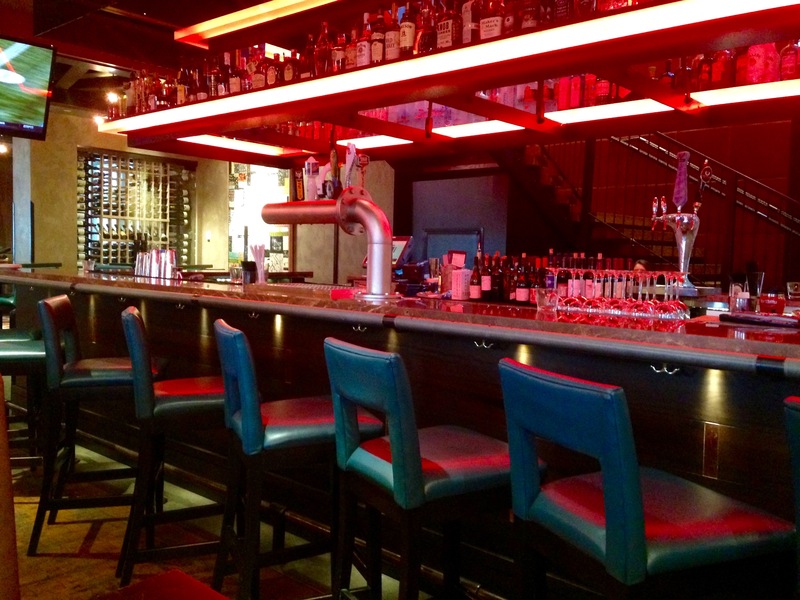 We like the decor, with nice use of colored lighting throughout the restaurant. Our guess is that they can change the colors if they want. Today, everything is awash in reds, including the bar. 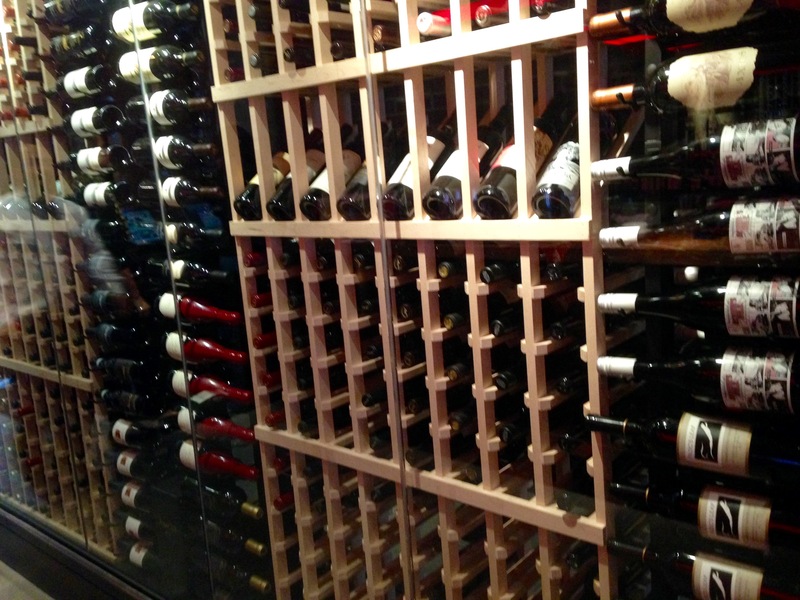 If you want wine, they probably have you covered with several “walls of wine”. The drink menu looks good, but it’s lunchtime and we would probably just fall asleep, so we stick with water today. Here’s the deal on their “Grab A Pair” menu: you get your choice of a personal-sized flatbread, half a chicken avocado wrap, half a bahn mi or two fish tacos, served with either a mixed salad, a Caesar salad or a cup of soup for $12. Our guess is that they get the food out pretty fast if you have to get back to work. We have no work to go to, so we can take our time. 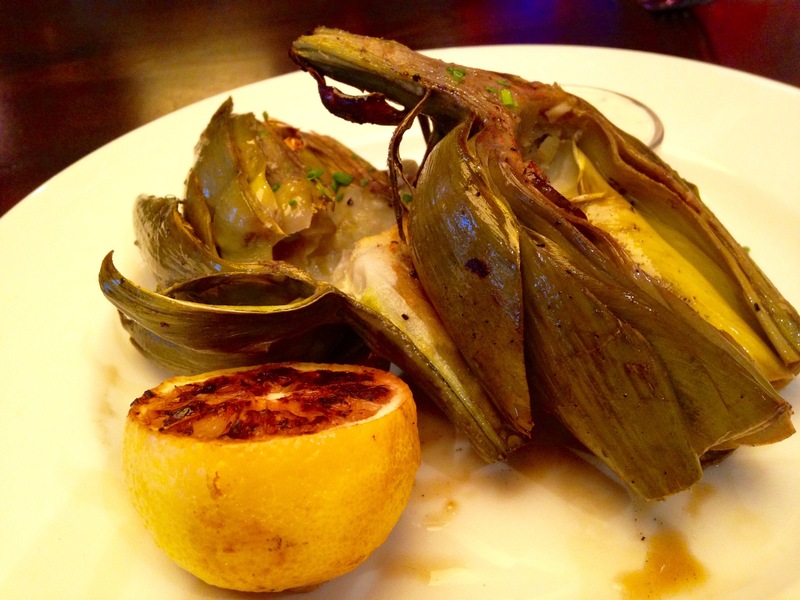 We start off with an appetizer, the fire-roasted artichoke. They have a stone oven in the kitchen and roast these babies up every day. The artichoke is nice and soft and the parmesan-black pepper aioli is a great accompaniment to this dish. Eve grabs a pair, the mushroom flatbread and a cup of corn bisque. The flatbread is full of big chunks of mushroom. Caramelized onions hide under the fontina cheese and arugula. It’s almost like a flatbread salad. The bisque is sweet and very creamy. The tortilla strips give it a southwestern flair. It looks good from the outside, but it is not cooked at all on the inside. It’s two pieces of pitiful-looking cold cheese. I hate sending food back, but this one gets returned. Ten minutes later, it looks like this. They finally get it right, but at least 30 minutes has elapsed since the initial order. 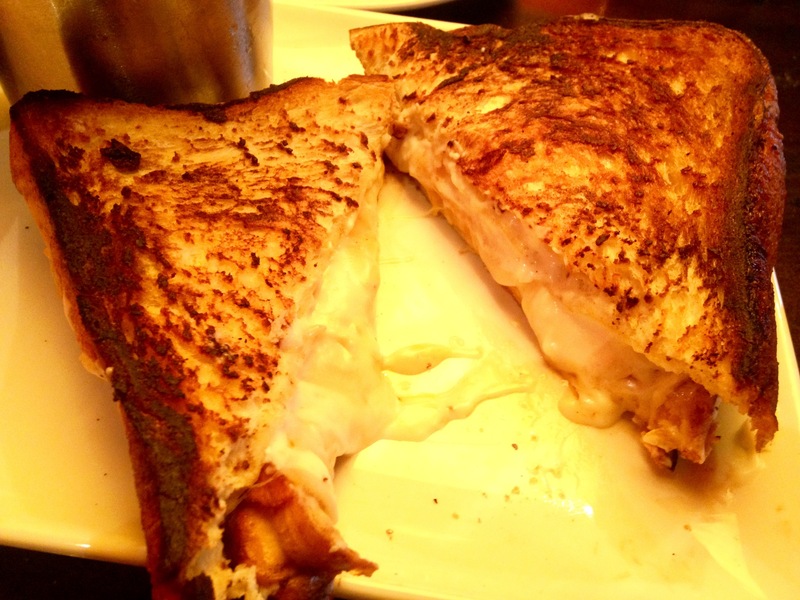 The cheese is hot and gooey and it’s good comfort food on a dreary day. There’s a nice aioli inside that oozes out with every bite. The fries are hot and taste very fresh. Isn’t the catsup holder cute? The Caesar salad is my way of making up for eating all of that cheese. General Manager Kenny Perlman comes over to introduce himself and to apologize for the “cheese debacle”. He insists that we try dessert. We are full, but this turns out to be a very good suggestion. Check out the lemon doberge cake. Doberge is a style of cake made popular in New Orleans. I just looked that up. 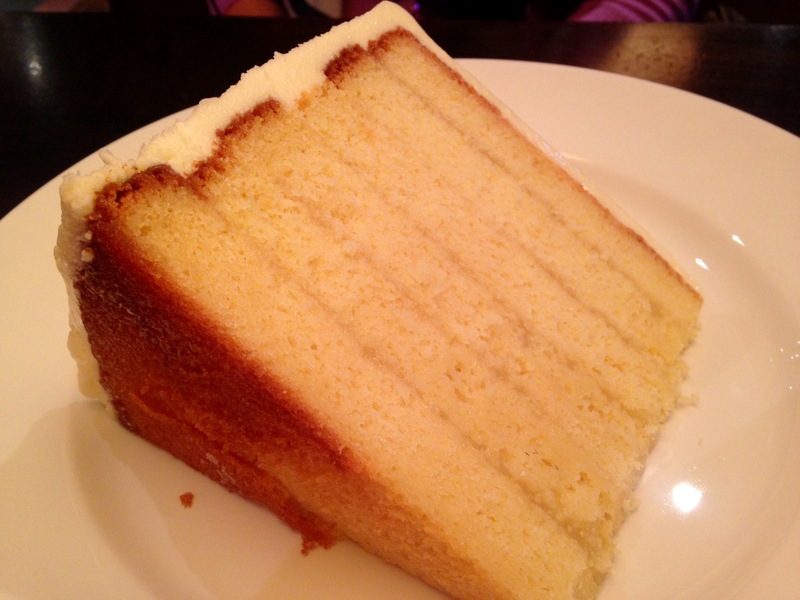 Six layers of lemony cake are separated with layers of lemon glaze. The whole thing is topped with lemon buttercream icing. There’s lots of love in this cake, which is made right here. 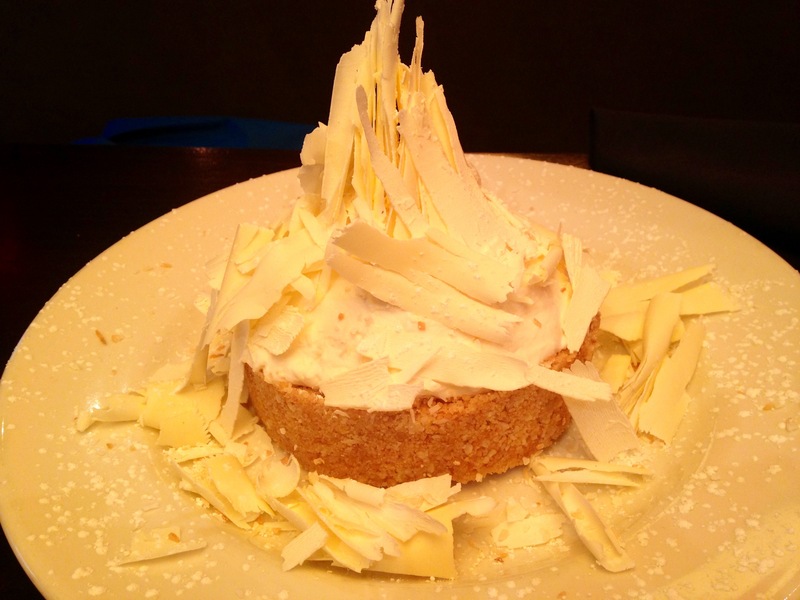 The photographic star of the meal is the coconut cream pie. This is way too pretty to eat, but in the interest of good reporting, we dig right in. Those are white chocolate shavings on top. Surprisingly, this is a very light dessert, with a coconut filling that is almost like whipped cream. Don’t worry, we do not eat all of this dessert. We take the leftovers home and enjoy dessert for the next two days. True story: While we eat dessert, I notice a guy at the next table eyeing what’s on our table. He’s eating a lettuce wedge with a side order of grilled chicken and I feel guilty about the amount of calories that must be in these desserts. I figure that he’s a business traveler who is watching his calories. Five minutes later, a piece of lemon cake is delivered to his table. I guess he just could not resist. The moral of the story is this: save room for dessert if you eat at Del Frisco’s. They are huge and four people can easily share one plate. 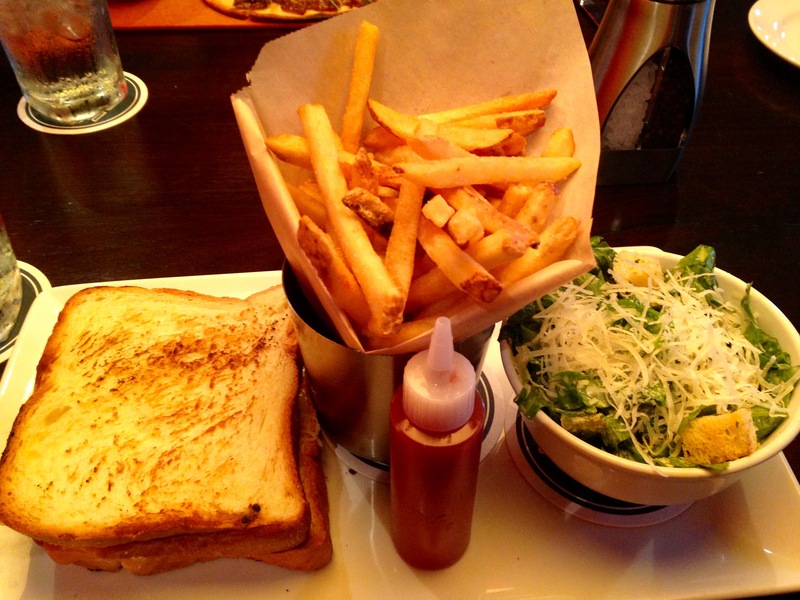 Disclosure time: Since this was a media lunch, we did not pay for our food at Del Frisco’s Grille. Our opinions, however, are priceless. Thanks to Kara McKenna at Quinn PR in New York for the invitation and to Kenny Perlman and his staff for being so hospitable. Previous Post Fabiano’s Pizza: Worth the Wait in Newnan?